As soon as the three from the corner was made with 2:40 remaining in the third quarter in last week's Game 5 of the Eastern Conference Finals, the debates erupted once again. As soon as the three from the corner was made with 2:40 remaining in the third quarter in last week’s Game 5 of the Eastern Conference Finals, the debates erupted once again. To me, there is no debate, for their greatness is obvious. But for others, it’s a mandatory topic of discussion, with proponents of each player taking their respective places on each side of the court. Some analysts and commentators feel LeBron has surpassed Jordan, others feel Jordan is the greatest, and a few state that there is no debate surrounding Jordan and James because of the many differences separating them. But the reality is that there is no debate because while their greatness is irrefutable, Jordan is comparable to no one. The debate over the greatness of players across various positions is nothing new. Centers have been compared for decades. Shaq, Olajuwon, Kareem, Wilt and Russell – all NBA Champions with claims to records, greatness and position. Point guards such as Russell Westbrook, Magic and Oscar Robinson will always be compared for their triple- double generation. Michael Jordan and LeBron James are two of the greatest players ever to grace the NBA hardwood. As individuals, they have both won multiple championships, been awarded multiple MVP trophies and always seemed to develop the skills critics condemn them for lacking each year. In order to win a championship, they had to mature and evolve, building upon lessons painfully learned the season prior. LeBron had to learn how to demand the ball and dominate. Jordan had to learn how to lead his team outside of the points column. Statistically, the players are relatively close, with some figures giving each player a thin lead over the other. We already know that LeBron now owns the all-time playoff scoring points record with 5,995 to Jordan’s 5,987. In terms of playoff scoring averages, Jordan holds the record with a career average of 33.45 while LeBron sits in fifth with 28.28. So while it’s obvious that scoring came easily for them, winning did not at first. They had to learn how to become champions. They had to learn how to trust their teammates. Jordan had to evolve towards trusting that players like Steve Kerr and John Paxson could take game-winning shots and make them. LeBron recognized that Kyrie was a superstar capable of winning games. They learned how to elevate their performances to win championships and secure NBA legend status. Jordan holds all time scoring records for the regular season (30.12) and playoffs (33.45) and sits in second in NBA Finals scoring history (33.60) behind Rick Barry (36.30). Jordan clearly took his game to another level in each round, with the deciding games being the place where he refused to lose. LeBron ranks fifth in both career regular season scoring average (27.13) and playoff scoring average (28.28), and sits in seventh place in respect to the NBA Finals (26.98). While LeBron has never led the League in points scored during the regular season, many times finishing second, Jordan dominated the category. He finished first in 11 seasons (’84, ’86 – ’92 and ’95 – ’97), with streaks of seven and three consecutive years in the latter two periods, which also included an NBA record 3,041 points in the ’86 season. Jordan basically duplicated the same dominance in regular season scoring averages, leading the league in the same aforementioned seven and three year seasons. To add to the impressiveness of Jordan’s ’86 season, he averaged 37.09 points in the regular season and 43.67 points in the playoffs, also NBA records. Been even this mythical performance couldn’t help the team as the Bulls were swept by the eventual NBA Champion Boston Celtics that year. So although he scored and won games, defeat in the postseason ultimately stifled MJ, and it took him six seasons of playoff disappointment to finally figure out how to overcome and win, securing his first NBA title in the ’90 – ’91 season. LeBron suffered similar disappointment early on his career, generating lots of points and playoffs appearances but no ring. After his rookie season, James has never missed the post-season, which is an amazing a stat as Jordan’s dominating numbers in the 1986 season. And similar to Jordan, it took LeBron six straight seasons of playoff disappointment to finally discover the formula for winning a championship. So what other insight can be provided to fuel the flames in this current debate dominating the airwaves, twitter and barbershops? Do we look at the epic moments and performances in their historic careers for evidence? “The Shot” over Craig Ehlo. The heart-snatching shot on Bryon Russell in the 1998 NBA Finals. “The Flu Game.’ All performances by Jordan forever seared into our minds. LeBron has also bestowed fans with many memorable performances, probably none more defining than “the block” in Game 7 of last year’s NBA Finals. With the game tied and less than two minutes remaining, Steph Curry threw a bounce pass to Andre Iguodala on a fast break, who appeared to have layup already in hand. It seemed as if the bad luck for Cleveland fans was about to rear its ugly head again. But in the corner of our eye was LeBron, running hard and stalking the play like a hunter does his prey. He stuttered his steps and when the ball left Iguodala’s hand he pounced, right hand extending to the top of the white box and swiping the ball in the air and rejecting it off the glass. It turned the momentum back to the Cavs, who eventually won the game and the title. They are two of the greatest players to have ever played the game. Two players who dominate both on the court and off of it, who inspire future ballers to imitate their moves and performances on courts across the globe. But despite the similarities, I have always felt comfortable in anointing Michael Jordan as the greatest player in the history of the game for one main reason. Jordan is not comparable to anyone because there was no one to compare him to. But Michael Jordan wanted to succeed and win as Michael Jordan, the greatest basketball player ever. BJ Amrstrong echoed these sentiments while giving advice to LeBron, saying that Jordan had to eliminate the comparisons in order to be the greatest. “That’s what Michael Jordan did. Jordan realized that in order to be the best, you had to get rid of all the comparisons. When you talked about who was the best player in the NBA, he was upset. When you talked about who had the most championships, he was upset.That’s what Michael Jordan did. Jordan realized that in order to be the best, you had to get rid of all the comparisons. Jordan not only defied comparisons, he refused to be told he couldn’t do something. He took it personally when he was criticized for a performance or for an alleged lack of skill. He was told that all he cared about was scoring, so he won the ’87 – ’88 Defensive Player of the Year Award. He was told he shoots too much and couldn’t shoot threes, so he increased his assist, rebound, field goal and three point shooting averages in the ’89 – ’90 season, all while reducing his shots per game and still keeping his season scoring average above 30 points. And if his critics included fans, he responded to them with equal enthusiasm. After dunking on John Stockton, a fan chastised him by telling him to pick on someone his own size. The next time down the court, Jordan rose up, dunked on Mel Turpin and asked the fan while running back down the court, “Was he big enough? Those who have come after him have either patterned their games after him or are compared to him, LeBron being one of them. On many occasions, James discussed Jordan’s influence on his career, even telling Sports Illustrated after winning the championship last year that he was looking to Chicago and it’s most famous basketball player for motivation. Even Shaq jumped into the conversation, responding with the following when asked about LeBron, whom he teamed with during the 2009 – 2010 season. He’s a mixture of Michael, Shaq and Magic. Shaq, because he’s bigger and stronger than everybody. Michael because he can score whenever he feels like it. And Magic because he does a great job getting everybody else involved. But it didn’t stop at the NBA hardwood; it extended to the blacktop where legends are born. How many young, NBA aspiring kids emulated the moves of Jordan in pick up games and begged to be given the #23 shirt in summer league games. Jersey numbers have meaning, from #1, #3 and #11 to #21, #32 and #33. Donning them honored NBA legends whose names are enshrined in Springfield, Massachusetts. But #23 stands out among all basketball numerals, and that was due to Jordan. Even the playground legends invoked the name of Jordan. Was Billy Harris the greatest basketball talent ever in the city of Chicago, even bigger than Jordan? Could Jordan jump higher than the Earl “The Goat” Manigault? “Between the ages of 16-30, there is no player that could ever beat me. Jordan, Doc, Bird, Oscar, Magic, any of ’em. I would have f—– them up. I’d give them 22 points in a game to 24. They would never beat me.”- Billy Harris. “For every Michael Jordan, theres an Earl Manigault. We all cant make it. Somebody has to fall. I was the one.- Earl “The Goat” Manigault. Both blacktop legends, holding some form of comparison to Jordan.Yet despite all of their hood fame, their paths to the League were deterred by personal and environmental circumstance, thus preventing their blacktop success from transferring to hardwood legend. But it’s not just the general basketball audience making the comparisons. It’s James himself. Even if he tries to avoid it, he has to address it because its a topic with consistent breath. Ive always told you guys, any time Im linked to any of the greats and even the greatest in Mike, its an honor,” James said before Game 5 against the Celtics. “Its a tribute to what Ive been able to do with this game. While LeBron acknowledges Jordan as the greatest, it shouldn’t diminish LeBron’s first ballot Hall of Fame career in any way, and that’s what these discussions sometimes appear to do when the comparison starts. And while these discussions do hold validity, when you venture beyond the typical statistical comparison and Jordan’s defiance of comparisons, the separation between the two widens through one additional factor which leaves the original #23 standing alone. He was the ultimate competitor, possessing the uncanny ability to instill fear in teammates and opponents, which inspired greatness and exposed weakness. LeBron is feared on the fast break as his speed and size intimidates those from attempting to prevent his monster dunks. But Jordan was literally feared, and that refers to the actual emotion of fear. His presence equated to sold out arenas and must see TV, but it was the way he actually instilled fear into players, coaches, teams and fans that elevates him to a solitary status. 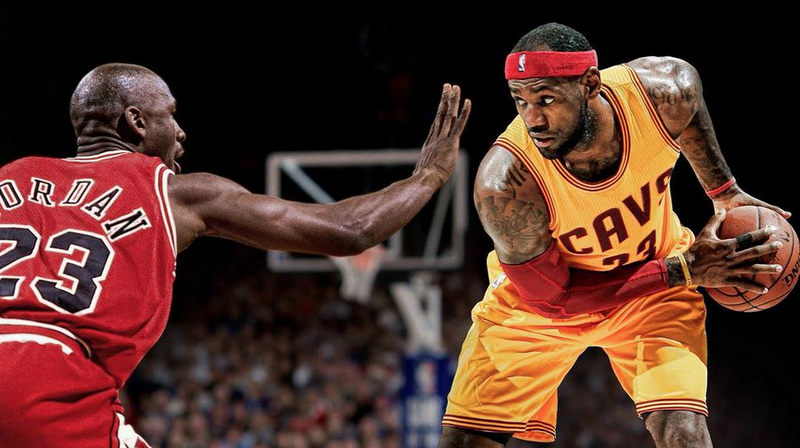 Knicks fans would be excited to see LeBron and Kobe at the Garden. When the Lake Show came to MSG, it was excitement in more of an entertainment style, especially due to the fact that the Knicks teams during that period werent very good. But when Jordan came to town, a jolt of electricity radiated throughout the city, one which combined excitement and fear. How many points would he drop on the team? Who would he dunk on tonight? Questions posed and almost always answered with emphatic, newspaper backpage headlining results. 55 points. Ewing was posterized. Familiar memories for those who suffered through the ’90s when the Knicks and Bulls enjoyed ferocious rivalry, games with tenaciousness, physicality and hatred that has not been seen in the League since, with predictable, painful memories for fans of the orange and blue who would leave the Garden disheartened more often that not. In today’s NBA, fans are excited to see LeBron and the Cavs come to town, but it’s not the same type of feeling, nor is it the same type of rivalry. The Garden doesn’t feel the same, and in some ways the shadows of Jordan’s memorable performances and bitter endings for the Knicks linger in the Garden and in the minds of fans. This wasn’t written to diminish LeBron in any way. Rather it’s meant to honor both LeBron and Jordan for the great players that they are while simultaneously shining light on how Jordan stands alone in discussions of basketball greatness. The #23s both faced a variety of critics who advanced critiques through “expert” analysis revolving around abilities they lacked. Yet both elevated their performances to learn how to win championships, silencing these voices of doubt, many of whom continue to invoke this very comparison every time the Finals roll around. So instead of trying to diminish his career or push him past Jordan, appreciate LeBron James for who he is and what he has accomplished. Three-time NBA Champion with eight NBA Finals appearances, including the last seven consecutive years. Four time League MVP and two time NBA Finals MVP. Thirteen All Star Games and now the all time playoff scoring leader. Then appreciate Jordan for all that he has accomplished and recognize that he stands alone in comparisons based upon NBA greatness. Is it fair to compare players from different eras that play different positions? But in the reality where basketball greatness is determined by success on the NBA hardwood, Jordan stands above all of those who made it to the League and those who didn’t.